The Roots of Right and Wrong: Do Concepts of Innate Morality Reduce Intuitive Associations of Immorality With Atheism? Atheists are frequent targets of prejudice and discrimination. Previous research suggests that anti-atheist prejudice may stem in part from perceptions of religion as an ultimate basis for morality: without God, why do good (or not do bad)? We conducted two studies to test whether presenting recent scientific findings regarding the nonreligious bases of morality (e.g., morality in nonhuman primates and preverbal infants) might lead people to view morality as innate, thus reducing intuitive associations of immorality and atheism. Consistent with previous research, participants viewed moral transgressions as more representative of atheists than of Christians. However, learning about the putatively innate nature of morality did not lead participants to view immorality as less representative of atheists. Intuitive moral distrust of atheists appears quite resilient, persisting even in the face of evidence for the nonreligious origins of morality. Frans thinks that people are born with an innate moral sense. Larry thinks that morality results from years of careful instruction and enculturation. Who is more likely to think that serial killers are atheists? In this paper, we present data from three studies aimed at testing the hypothesis that intuitive associations of immorality with atheism derive, in part, from people’s perceptions of the very roots of right and wrong. That is, that views of the origins of morality may play an important role in the psychology of anti-atheist prejudice. In America, even as overt types of prejudice towards other religious or ethnic outgroups are becoming less socially acceptable, exclusion of atheists is still prevalent and largely tolerated. Atheists are among the least liked, least desired, and most excluded individuals in America. For example, nearly half of Americans would not vote for an atheist candidate in a presidential election (Green, 2007). Americans are similarly reluctant to let their children marry an atheist, and they view atheists as the group that least agrees with their vision of American society (Edgell et al., 2006). In some states, there are actual laws that require those holding office to hold religious beliefs (Gervais, 2013). Beyond large scale polls, more focused laboratory work has shown that atheists are viewed with disgust (Ritter and Preston, 2011) and are potentially targets of workplace discrimination in some fields (Gervais et al., 2011). These results hold even when avoiding the potentially charged label of “atheist” by presenting participants with a definition (Swan and Heesacker, 2012). Combined, these patterns are indicative of a constellation of negative attitudes, preferences, and behaviors—collectively referred to as anti-atheist prejudice—in which atheists are routinely excluded and vilified. From a variety of classic psychological approaches to prejudice, anti-atheist prejudice is in some ways odd (see, e.g., Gervais, 2013). Atheists are both collectively and individually inconspicuous. Collectively, they are a heterogeneous group (if indeed a negatively defined attribute such as not believing in gods necessitates the existence of a group), who share no common agenda and are not cohesive. At the individual level, being an atheist is an easily hidden trait that is difficult to infer in the absence of public disclosure (Charles et al., 2012). Yet, many classic psychological approaches stress that prejudice results from conflict between cohesive groups (e.g., Allport, 1979) or inferences made about individuals based on observable group identities. In sum, anti-atheist prejudice is a very curious one, and may require a slightly different theoretical perspective to be fully understood. Instead of classic approaches, it may be necessary to use more recent evolutionary approaches to prejudice (e.g., Cottrell and Neuberg, 2005) Schaller & Neuberg, 2012). In this view, it is perhaps a futile exercise to try to identify one single psychological foundation (such as intergroup conflict) for all expressions of prejudice against different groups. Instead, evolutionary approaches stress that different groups of people may provoke psychologically distinct prejudices in response to the specific functional threats that different groups are perceived to pose. For example, black men are viewed as threats to physical safety, and prejudice against them is typified by fear, whereas gay men are instead viewed as potential pathogen threats and viewed with disgust (Cottrell and Neuberg, 2005). According to evolutionary approaches to prejudice, one must understand the threat a group is perceived to pose in order to understand how prejudice against a given group might manifest. Utilizing this approach, anti-atheist prejudice may stem from the view that atheists are moral wildcards who cannot be trusted, suggesting that distrust is central to anti-atheist prejudice (Gervais et al., 2011). Though atheists likely don’t commit more crime in general or crimes of greater severity than theists (Didyoung et al., 2013), many people have an intuitive notion that religion and morality are inextricably linked (e.g., Bloom, 2012). Most Americans, as well as majorities in most other countries worldwide, view belief in a god as a necessary component of morality (Wike & Menasce Horowitz, 2007). By extension, atheists may be seen as lacking in morality because of their explicit rejection of god(s), leading to distrust. In support of this possibility, Gervais (2014) found that various moral transgressions, ranging from minor offenses like cheating at cards to much more serious transgressions like serial murder, are seen as representative of atheists, but not of 11 other religious and ethnic groups. Further, even atheist participants still viewed these moral transgressions as more representative of atheists than of other groups. Finally, the results were driven specifically by moral doubts stemming from atheists’ lack of belief in gods rather than from their lack of belonging to religious moral communities. Understanding the psychological foundations of a given form of prejudice can highlight potential interventions for reducing that prejudice. Evidence for distrust reduction, while at its infancy, is emerging. Perceived prevalence of atheists in an area is negatively correlated with anti-atheist prejudice (Gervais, 2011). For example, in countries where atheists are more prevalent, distrust of atheists tends to be lower; in addition people who perceive atheists as more prevalent tend to trust them more. Supporting a causal interpretation, reminding people that atheists are common results in decreased anti-atheist prejudice in both implicit and explicit measures. In addition to prevalence information, reminding people that there are secular reasons to be good similarly reduces distrust of atheists. Specifically, secular authority—police, courts, and the like—reduces theists’ distrust of atheists (Gervais and Norenzayan, 2012), suggesting that when people are reminded of the social structure in place that protects and watches them, their belief that a supernatural watcher is necessary for morality is reduced. While some studies have successfully reduced distrust of atheists, it may be possible to target distrust of atheists at its roots: perceptions of religion’s role as a necessary precursor to morality. With this in mind, the present studies investigated whether presentations of scientific information regarding the non-religious roots of moral cognition might ease intuitive associations of immorality with atheism. Specifically, we tested whether reading about recent scientific findings of moral intuitions in non-religious individuals such as bonobos (e.g., de Waal, 2013) and preverbal infants (Hamlin et al., 2007) might make people view religion as less necessary for morality, and thus reduce intuitive associations of atheists as potentially immoral. Before testing our focal hypotheses regarding the degree to which notions of innate morality might reduce intuitive associations of immorality with atheism, we first conducted a pilot study to determine whether reading about scientific information regarding the roots of morality does, in fact, lead people to dissociate morality from religion. One hundred and thirty two participants (99 females) completed the study in exchange for course credit. In this pilot study, participants read either a control passage or one of three separate summaries of recent scientific findings on morality. That is, participants were randomly assigned to read passages on the innateness of morality in infants, bonobos, or neuroscience research detailing moral origins and moral processes in the brain. Then, they rated the degree to which they think that morality is innate. A one way ANOVA revealed that the participants’ ratings of the innateness of morality significantly differed across conditions, F(3, 129) = 3.29, p = .02. Follow-up pairwise comparisons revealed that innateness ratings were higher in the control condition than in the Babies, t(65) = 1.95, p = .055, Bonobos, t(61) = 3.02, p = .004, and Brains, t(69) = 2.52, p = .01, conditions. In sum, all three of the reading primes were effective in changing participants’ views on the innate nature of morality. Two-hundred and forty students at the University of Kentucky participated in the study in exchange for partial course credit. Religious affiliations were predominantly Christian (24% Catholic, 28% Baptist, 31% Other Christian Denominations, 1% Buddhist, 1%, Muslim, 1% Jewish, 3% Other, 5% None, 3% Atheist, 4% Agnostic). Participants’ ages ranged from 18-41 years old with just under 98% of participants falling within the age range of 18-22 years old. Participants were given the option of choosing a “mini-study”, all of which led to a randomized condition of the experiment. Experiment 1 utilized a 2 (Primes: Control vs. Bonobos) x 2 (Target: Atheists vs. Christians) factorial design. In each condition, participants were presented with a short reading passage that constituted of either the nonhuman primate morality prime or the control passage (an article about food). After the reading passage, participants were presented with the conjunction fallacy task. In this task, participants first read a vignette describing a fictitious person committing a moral violation, in this case, stabbing a person to death (See Appendix A). Half of the participants were asked whether it was more probable that A) Richard is a teacher, or B) Richard is a teacher and a Christian. The other half were asked whether it was more probable that A) Richard is a teacher, or B) Richard is a teacher and someone who doesn’t believe in God. In this task, people only tend to choose option B when they intuitively judge the description to be representative of the target group implied in option B (Christian or atheist). In previous research, people tend to view moral violations as more representative of atheists than of other groups. Following this task, participants were given a series of logic problems to complete. The logic section served as a disguise for the true purpose of the study. Next, participants completed a manipulation check question about what they thought the study was about from the options of reasoning and logic (desired response), memory, prejudice and stereotyping, emotion perception and language fluency. Finally, participants completed several demographic measures where they provided information on their age, gender, ethnicity, religion, attitudes towards others, along with belief in God, political ideology, and socioeconomic status. 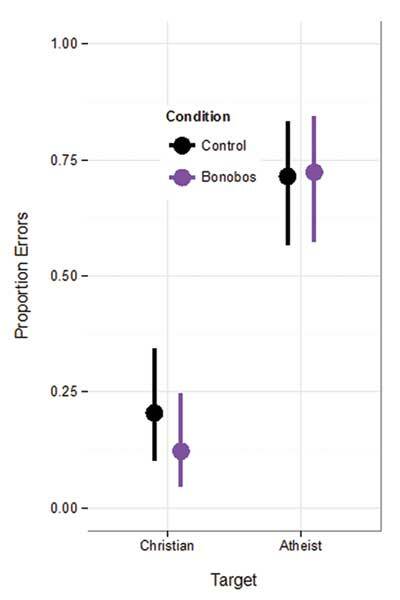 To test whether the innate morality prime changed the degree to which participants viewed moral violations of atheists, we conducted a 2 (condition: Control vs. Bonobos) x 2 (target: atheist vs. Christian) logistic regression. This analysis revealed a significant effect of target (OR = 9.75, 95% CI: 3.98, 25.85, p = 1.6 x 10-6), indicating that—consistent with previous research—moral violations were seen as more representative of atheists than of Christians. However, there was no effect of condition (OR = .54, 95% CI: .17, 1.60, p = .27) and no significant interaction (OR = 1.92, 95% CI: .47, 8.20, p = .37), see Figure 1. A follow-up logistic regression evaluated only the effects of condition with the atheist targets, and revealed no effects of the prime (OR = 1.04, 95% CI: .43, 2.57, p = .92). These data replicate previous work finding that immoral deeds are seen as representative of atheists. Contrary to our prediction, however, learning about the putatively innate nature of morality did not make people view atheists as less likely to commit immoral actions. Reading about morality in nonhuman primates did not reduce intuitive associations between immorality and atheism (Point estimates and 95% CIs of the proportion of participants who committed the conjunction error in each condition). Two-hundred and fifty students at the University of Kentucky participated in exchange for partial course credit. Participants’ religious affiliations were similar to the previous sample (27% Catholic, 21% Baptist, 32% Other Christian Denominations, <1% Buddhist, 2%, Muslim, 4% Other, 8% None, 3% Atheist, 3% Agnostic), as were their ages (18-41, 98% 18-22). Experimental procedures were identical to those in Experiment 1 with two exceptions. In Experiment 2, the experimental reading passage contained different content used to prime participants. In this case, it primed the notion of innate morality by presenting research suggesting that even infants possess rudimentary moral intuitions. The moral violation was once again grounded in the moral foundation of harm, but in this instance described the moral violator as inflicting harm on animals and progressing to serial murder of humans (See Appendix A). We tested whether the reading passage priming infant morality changed the odds of participants committing a conjunction error for atheist and Christian targets in a 2 (condition: Control vs. Babies) x 2 (target: atheist vs. Christian) logistic regression. This analysis revealed a significant effect of target (OR = 14.59, 95% CI: 5.86, 39.36, p = 3.2 x 10-8). Once again, people found the moral violation more representative of atheists than of Christians. However, there was no effect of condition (OR = 1.14, 95% CI: .38, 3.47, p = .81) and no significant interaction (OR = .99, 95% CI: .26, 3.69, p = .98), see Figure 2. A follow-up logistic regression testing the effect of condition within the atheist target condition revealed no effect of the prime (OR = 1.13, 95% CI: .53, 2.39, p = .75) again showing no significant effect of the reading primes on changing participants’ intuitive perceptions towards atheists via the representative heuristic task. As in Experiment 1, participants viewed moral transgressions as representative of atheists, even in the face of scientific evidence that morality has an innate basis. Reading about morality in preverbal infants did not reduce intuitive associations between immorality and atheism (Point estimates and 95% CIs of the proportion of participants who committed the conjunction error in each condition). In two studies, we attempted to reduce the intuitive association between atheists and immorality by manipulating people’s beliefs about the innateness of morality. We made two specific predictions. First, we predicted that, consistent with previous research, people would view immoral acts as more representative of atheists than of Christians. More importantly, we predicted that participants primed with the notion that morality is innate would view immorality as less representative of atheists. Our pilot study revealed that the primes used were effective in changing participants’ views on the innateness of morality. Despite this, priming participants on the innateness of morality did not affect their intuitive perception of the association between atheists and immorality (Experiment 1 and 2). Atheists were still seen as more likely to engage in immoral behavior, even though the primes effectively increased participants’ perceptions of morality as innate. Importantly, the present results were not strictly null, as they closely replicated previous work finding that immorality is seen as representative of atheists (Gervais, 2014). This deeply ingrained belief that religion is the antecedent of morality has multiple implications for our null findings. Firstly, while the innate morality primes may have been successful, people’s lay theories dictating the causal pathway from religion to morality might be impervious to change. In this view, atheists, without any religion, are seen as immoral regardless of evidence for the innateness of morality. Participants may have viewed morality as stemming from an innate seed, but nonetheless requiring religious support to properly flourish. Without this religious support for core morality, participants may view atheists as simply straying for their originally moral potential. Last but not least is the notion of original sin, central to many Christian teachings. Even though there are variations, the broader concept of original sin is that humans are born into the world with a sinful nature, due at least partly to Adam and Eve. Many biblical passages clearly state that humans are born with sin, such as Psalm 51.5, “Behold, I was shapen in iniquity; and in sin did my mother conceive me” (King James Version). Such passages could lead to a perception that humans’ innate nature for being good does not preclude us from the capacity for evil, given our already sinful nature at birth. Thus, while morality may be innate, other factors may influence moral development, allowing for atheists to be seen as immoral regardless of the putatively innate bases of morality. Finally, we note that the present results make some sense in light of cognitive dissonance theory (Festinger, 1962). When presented with new information about the innateness of morality that contradicts their strongly held perception that belief in gods is a prerequisite for morality, people experience cognitive dissonance, which is psychologically stressful. This apparent inconsistency motivates people to actively reduce their cognitive dissonance. Dissonance can be reduced in several ways, and one of them is especially pertinent: justify cognition by adding new cognitions. In this respect, people may view some aspects of morality as innate, but may also believe that without some religious instructions, atheists may along the way “lose” their morality without proper guidance from a morally-concerned religious figure or doctrine. Thus, believing that morality is innate does not necessarily lead people to think that morality is stable and unchangeable. One can easily imagine how a person can initially be a good person, but over time regress to immorality without proper instruction. The present experiments relied on very graphic content in the moral violations scenarios that were used. Though Gervais (2014) showed that these moral violations that are based in harm are indeed seen as representative of atheists, perhaps they are too severe and therefore distracting for the purposes of this study. One goal for future studies is to present participants with more mild, yet still relevant, moral violations so that they are more plausibly influenced by an innate core morality. Another aim for future studies is to increase the salience of the innate morality primes. Even though the primes had an effect on the self-report measures that gauged participants’ views on the innateness of morality, they may have been less effective at changing underlying intuitions. Finally, a more sensitive outcome measure may be necessary for subtle experimental manipulations. Because the conjunction fallacy task is binary in nature, a more granulated approach might help tease apart effects of the primes. For example, participants could be asked to indicate the probability that the protagonist in the scenario is a teacher versus a teacher and an atheist. A shift in attitude may be gradual instead of being instantaneous and so a lower overall probability could reflect an initial modification in attitude that can only be captured by more subtle measures. Advances in evolutionary and comparative psychology are showing that much of human morality is built on innate foundations. Though this goes contrary to what many intuitively believe, their beliefs about the innateness of morality are malleable to a degree, as shown in our current study. Despite this malleability and the distrust centrality of moral distrust to anti-atheist prejudice, shifting opinions about the putative innateness of morality does not seem to affect perceptions of atheists as immoral, suggesting that distrust of atheists is more ingrained than might otherwise be expected. People may come to believe that morality is largely innate, without coming to believe that atheists are as able to effectively resist their most base urges. Richard was driving home from work one day through a bad neighborhood. He pulled his car into an alley where nobody would see it. He got out of the car and walked over to where a homeless woman was sleeping. Nobody was looking, so Richard stabbed the woman to death. When Richard was a child, he began inflicting harm on animals. It started with just pulling the wings off flies, but eventually progressed to torturing squirrels and stray cats in his neighborhood. As an adult, Richard found that he did not get much thrill from harming animals, so he began hurting people instead. He has killed 5 homeless people that he abducted from poor neighborhoods in his home city. Their dismembered bodies are currently buried in Richard’s basement. De Waal, F. B. M. (2013). The bonobo and the atheist: In search of humanism among the primates. WW Norton & Company. Festinger, L. (1962). A theory of cognitive dissonance. Stanford university press. Green, J. C. (2007). The Religion Factor in the 2008 Election. Religion & Public Life In: Pew Research Center. Wike, R. and Menasce Horowitz, J. (2007). Chapter 3. Views of Religion and Morality In: Global Attitudes & Trends. Washington, D.C.: Pew Research Center.